On Monday morning, the first day of spring, I stepped out my door and looked up to the clouds that were breaking. I smiled to think how the chill this morning would be warming up as the day went on, according to the weather forecast. Still gazing at the sky, I remember saying, “Good morning, World!” Well, I started to say that, but as the W came out my foot slid out and away, landing me instantly and jarringly on my back. I don’t know how I managed to not crack my head open on the concrete steps, let alone how I saved all but a few drops from my coffee thermos. The pain I would be in was not yet fully known. I was up immediately and spreading salt on the steps. The previous layer had been washed away by yesterday’s melting snow, and the water had frozen over again in the night. I was soon up the hill and shoveling out the book drop for my little library. Only when I leaned the shovel against the wall did I notice my bleeding hand. And as the day went on the pain and discomfort increased and spread. I met Okla just this fall at the New American Press poetry reading he hosted with Raul Clement at an Irish bar in town. 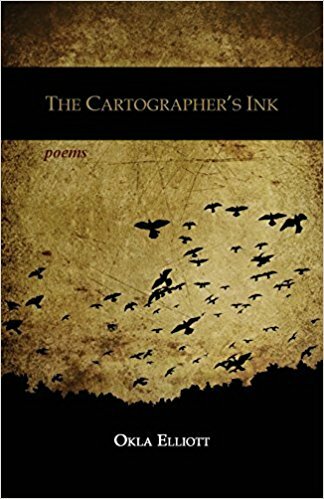 That’s the night I bought his book, The Cartographer’s Ink. Solely on the recommendation of a friend and fellow poetry professor, Okla asked me to be one of the readers at the next event in April, and since then we had many discussions online, both public and private. One of our last conversations was about meeting up for lunch or coffee sometime soon. This loss is incalculable. I was only one of countless writers, students, and scholars in whom Okla invested untold time and energy. And his devotion went beyond the circles of academics, politics, and literature, into the street and the soup kitchen. One of our only disagreements was a friendly one in which I was more cynical about the American people and the election that he was capable of being. The good people at As It Ought to Be, an online publication Okla founded, have written and shared links to some moving words in his memory. I was encouraged to find there a link to this article by Kenneth Nichols, urging people to go and read Oka’s works. I continue to find myself at a bit of a loss for what to say myself, though the scene of me on my back on the ice seems to want to become a poem eventually. Yesterday I pulled Okla’s book off the shelf and began reading those poems again. There is this thing I like to do, am drawn to do, and if you’ve spent much time here on my blog you’ve probably seen and listened to some of the scores of videos and SoundCloud recordings I’ve done over the last eight years. Reading poems out loud is, I think, one of the best ways to live in them, and to share them. It’s the thing I do probably better than the writing of my own poems, this reading the poems of others out loud. And Okla’s words continue to live as we read them, silently of course, but also audibly, in our own voices. In honor of Oka’s famed Penguin Pants, I spent some time recording these last night in the bear pajama pants I’d told him about. I like to think he would have chuckled at that. I decided to record two or three, and what follows are the three I couldn’t help but read aloud. The images are from his favorite photos folder on Facebook. If one of them is yours, please let me know so I can give you credit. I liked “The Light Here” best. I still think these recordings are great. Really like the clear diction of these, the simplicity. I have now found two more poets that I need to explore.